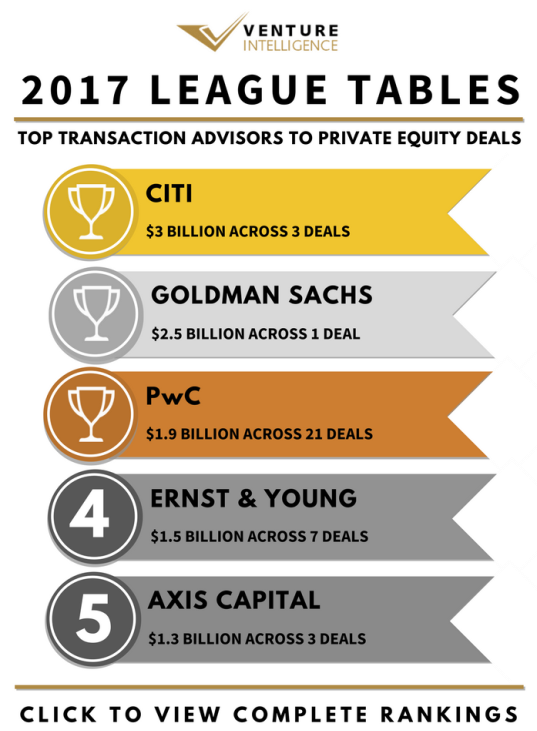 The investment banking unit of Citi claimed the top position in the Venture Intelligence League Table for Transaction Advisor to Private Equity deals in 2017 advising deals worth $3 Billion. Citi acted as the financial advisor to Flipkart in the reported $2.5 Billion investment by Softbank Vision Fund. Goldman Sachs (which advised the same deal) and PwC (which advised the $500 million investment by CPPIB in Indospace Core) accounted for the second and third spots respectively. Ernst & Young (which advised the $1.4 Billion DLF Cyber City - GIC deal) and Axis Capital (which advised the $1 Billion investment by Bain Capital in Axis Bank) completed the Top 5 list by value. PwC (21 deals) and Unitus Capital (15 deals) topped in terms of volume of PE deals advised, while Avendus claimed the third spot advising 13 deals worth $695 million. Veda Corporate Advisors and Creedcap Asia came in at fourth position advising 8 deals each. Ernst & Young and IndigoEdge came at fifth advising 7 deals each. Inclusive of its roles in due diligence and related advisory activities, PwC advised deals with a value tag of $15.8 Billion (across a total of 117 deals) during 2017. EY advised deals during the period included the investments by Softbank in Flipkart and Paytm and the investment by Bain Capital in Axis Bank. By deal count, Ernst & Young came in second advising 29 deals worth $4.1 Billion. Among Impact / Social Venture investments, Unitus Capital topped followed by Intellecap which advised 5 deals worth $56 million. In IT & ITeS, the top advisors by value remained the same as the toppers in the composite table. By deal volume, Creedcap Asia came first advising 7 deals followed by Avendus (6 deals) and Unitus Capital (5 deals). In Financial Services, JP Morgan topped the table, advising the Axis Bank - Bain Capital deal and the India Value Fund led buyout of Religare Health Insurance, followed by Axis Capital and PwC. By deal volume, Unitus Capital topped with 6 deals followed by Spark Capital Advisors and Intellecap with 4 deals each. In Healthcare & Lifesciences, Allegro Advisors came first advising deals worth $245 million, followed by PwC ($206 million across 3 deals) and Moelis & Company ($106 million). Veda Corporate Advisors topped the volume chart with 4 deals followed by PwC, Avendus and Allegro Advisors with 3 deals each. In Real Estate, Ernst & Young topped advising the DLF Cybercity - GIC deal, followed by Standard Chartered Bank with $460 million (across 2 deals) and Deloitte with $250 million. PwC and Sprout Capital came in first by deal volume, advising 3 deals each.